Whether you’re looking for a place to get your oil changed or need extensive auto repairs, it can be tough to know which auto repair shop is the best for you and your vehicle. Luckily, you don’t have to go it alone. Armed with the following guidelines and questions to ask, you can choose a quality auto repair shop with confidence. When it comes to choosing a reliable auto repair shop, nothing beats a good word of mouth recommendation. The best shops are not always the ones with the biggest advertising budgets. More often than not, they are the smaller, family-owned operations. Word of mouth recommendations come from satisfied customers; chances are, if your friends and family are happy with a particular auto repair shop, you will be, too. However, if you’re new in town and don’t know anyone who can give you a recommendation, online reviews and websites such as Angie’s List can be a great place to start. Where an auto repair shop is located can make a big difference in how much you’ll be charged for service and repairs. Labor charges can vary widely depending on how upscale the area is. Some shops in affluent neighborhoods charge over twice as much per hour for labor than shops in more modest locations. There are guidelines for mechanics to follow regarding how long different types of repairs should take. A reputable shop will generally follow those guidelines and charge for labor accordingly, while other shops may simply ignore those guidelines. It’s important to get multiple estimates from multiple auto repair shops. While you can let your fingers do the walking to get a rough idea of what costs you can expect, a mechanic won’t be able to give you an accurate estimate without examining your car in person. However, if taking your car to several different repair shops just isn’t feasible and you must get quotes over the phone, ask if the shops will guarantee their prices. 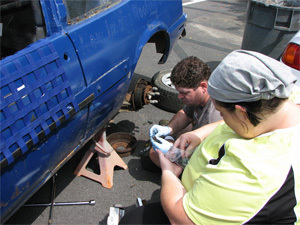 Additionally, ask each mechanic if s/he is willing to match prices if you find a lower estimate. While it’s tempting to go with the lowest price quote, keep in mind that the cheapest doesn’t always mean the best. When choosing an auto repair shop, sometimes you do get what you pay for. On the other hand, just because a shop charges more than the rest doesn’t automatically mean you’ll get the best service there, either. Most likely, you’ll simply be overcharged. It’s a good rule of thumb to avoid the highest and lowest estimates and aim for shops with quotes in the mid-range. While you shouldn’t judge a book by its cover, you can actually judge an auto repair shop by its appearance. There are several key things to look for when scouting out a shop. For instance, is the shop well organized? Are there certifications posted where you can see them? Are the mechanics wearing any type of uniform? Are there dirty rags and tools lying around, or are the workstations kept neat and tidy? Is the shop equipped with modern diagnostic tools and auto lifts, and do those tools seem to be well maintained? Chances are, if the shop is in chaos, your service will be, too. Conversely, if the shop is efficient and organized, the service will most likely reflect that. Is there a warranty for the work done? One-year warranties are standard, while lifetime warranties are sometimes offered. However, be sure to read the fine print, as it can be easy to inadvertently violate the terms resulting in a null and void warranty. What type of parts will be used? Many shops will offer you a choice between OEM (original equipment manufacturer), aftermarket or used parts. OEM parts will generally cost more, used will most likely cost less, and aftermarket (parts made by various manufacturers) will usually fall somewhere in between. If you must choose used parts, make sure they are covered by a warranty. Are the mechanics ASE-Certified? ASE-Certified (Automotive Service Excellence) mechanics must meet specific standards to qualify and must renew the certification every five years. Finally, there’s nothing like your own gut feelings to tell you if you’ve come to the right place. Even if an auto repair shop meets all the qualifications discussed above, if something just doesn’t feel right, then trust your gut and go somewhere else. What matters most is that you feel comfortable and confident that your car is in capable hands.